Demographic patterns in the new survey, which was conducted in September and October, are similar to those in a 2015 survey by the Center. 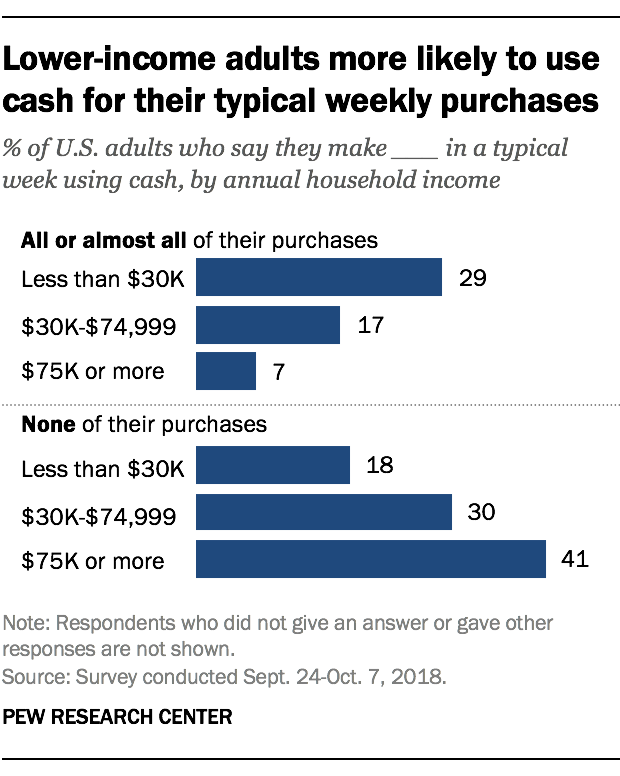 Most notably, adults with an annual household income of $75,000 or more are more than twice as likely as those earning less than $30,000 a year to say they do not make any purchases using cash in a typical week (41% vs. 18%). Conversely, lower-income Americans are about four times as likely as higher-income Americans to say they make all or almost all of their purchases using cash (29% vs. 7%). Blacks are more likely than whites or Hispanics to rely on cash: 34% use cash for all or almost all of their purchases, compared with 15% of whites and 17% of Hispanics. 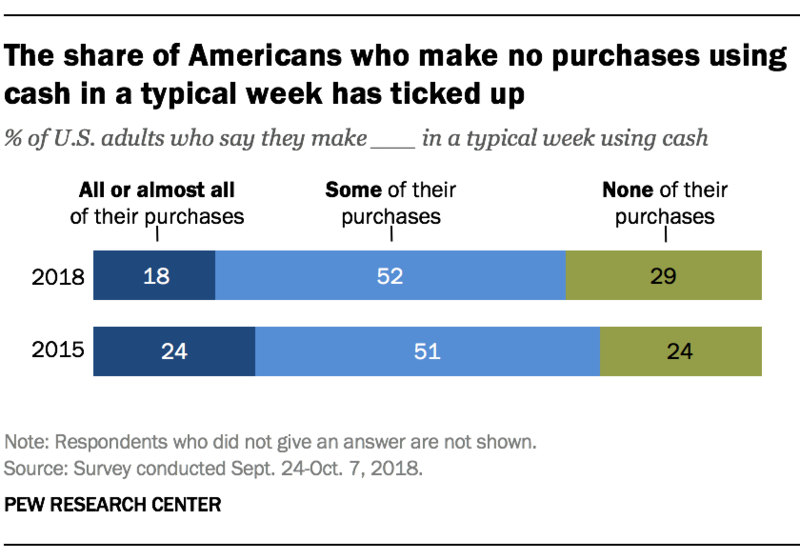 And 34% of adults under the age of 50 make no purchases in a typical week using cash, compared with 23% of those ages 50 and older. As more Americans are going cash-free, a growing share of the public is comfortable being without physical currency. 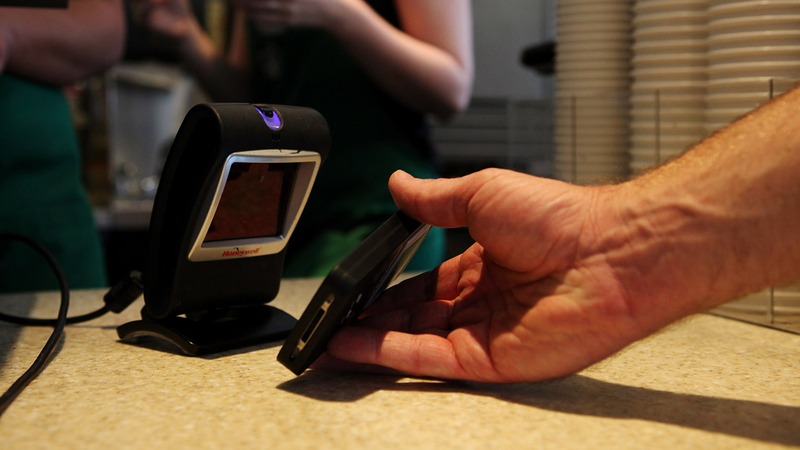 Today, 53% of Americans say they try to make sure they always have cash on hand just in case they need it. That represents a 7-percentage-point decline from the 60% who reported this in 2015. 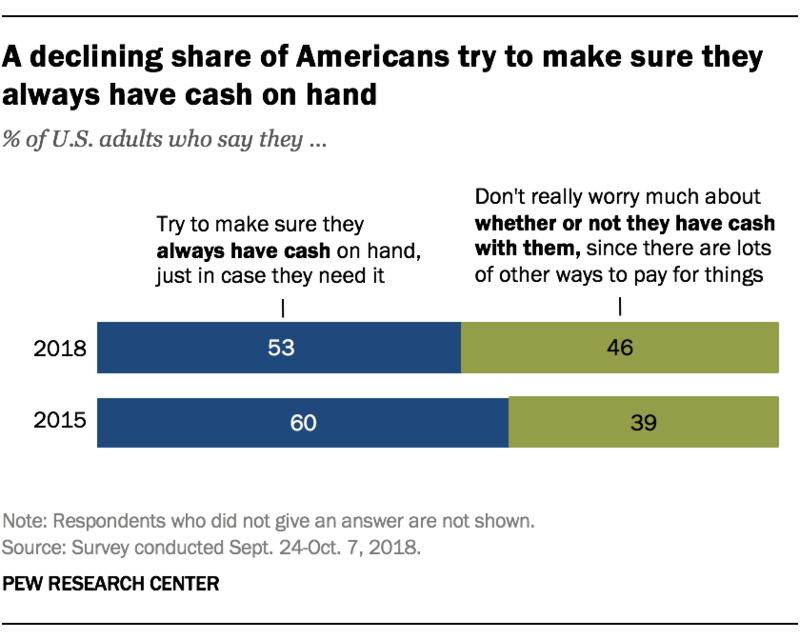 Conversely, just under half (46%) of Americans “don’t really worry much about whether they have cash with them, since there are lots of other ways to pay for things.” That is an increase from 2015, when 39% reported this. Roughly four-in-ten who say they do not really worry about carrying cash (43%) say they don’t use cash for their typical weekly purchases, compared with 18% of Americans who report that they try to ensure that they always have cash. Americans under the age of 50 are more likely than those ages 50 and older to say they don’t really worry much about having cash on hand: 52% of 18- to 49-year-olds say this, compared with 38% of those 50 and older. Similar shares of Americans by household income, education level, gender and race or ethnicity express these views.